Here we go with a batch more cards to examine and review. To keep things simple for myself, I'm going to review cards once they are available on Hearthstone's Facebook page. Excellent - Can't go wrong with this in your deck; it will probably become standard fare. Good - A more or less excellent card for specific kinds of decks. Fair - Situationally useful, perhaps as a utility or "tech" card, but not a mainstay addition. Poor - If you have nothing better to use, go ahead. Poor cards are probably still serviceable, but are underpowered relative to higher-performing cards. Terrible - Probably best not to run this. Millhouse Manastorm - Embarassingly bad, up to the point where you're handing your opponent the game. The caveat from last post (that the cards' relative utility may shift because of balance changes to the existing cards and the removal of Goblins vs. Gnomes and Naxxramas content from Standard play format) remains in effect. For this post, we're going to look at the other legendary cards revealed in the set thus far. We're also going to look at the small group of cards with an interesting mechanic: the "Forbidden" mechanic. N'Zoth is one of the other Old Gods, the primordial evil rulers of Azeroth. Like C'Thun and Yogg-Saron, he was imprisoned by the titans long ago. Part of the lore of Azeroth is that Kalimdor and the Eastern Kingdoms were once a more or less unified supercontinent, and were broken up during a long-ago invasion of the demonic Burning Legion. During the break-up, N'Zoth's prison apparently ended up buried beneath the ocean floor. Like the other Old Gods, N'Zoth is expert at corrupting other creatures, and indeed since making his first direct appearance with the launch of Whispers of the Old Gods he is being given credit with being the Old God who corrupted the mighty Deathwing, and is likely to have been the Old God at work throughout the World of Warcraft Cataclysm expansion. Truly, the paragon of tentacled monstrosity. 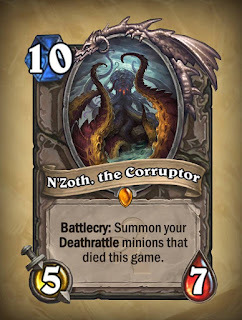 As a Heartshstone card, N'Zoth looks pretty interesting. While his battlecry works well in an aggressive deathrattle-themed deck, you could also run some heavy-hitting deathrattle minions such as Sylvanas, Cairne Bloodhoof, Rhonin, or Tirion. In Wild format, where the multitude of deathrattle minions from the Naxxramas or Goblins vs. Gnomes sets can still be used, N'Zoth's ability could very well be decisive. Because so many of the best deathrattle minions will not be available in Standard when the play formats launch, N'Zoth's ability, while still very good, isn't game-changing amazing. In Wild, when you can summon up the likes of Sludge Belcher, Stalagg and Feugen, or Piloted Shredder, N'Zoth's battlecry could very well win games all on its own. Yet another Old God, Y'Shaarj, or at least its legacy (well, and its heart), features heavily in the World of Warcraft Mists of Pandaria expansion, especially its closing storyline arc. I don't know how to say this, but, he's kind of a Big Deal. In Hearthstone, Y'Shaarj is a big, beefy minion that brings other minions from your deck into play. 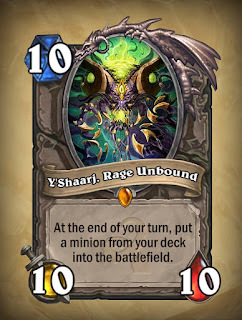 At 10 mana, Y'Shaarj is a very slow card: too slow to be a reliable anti-aggro card. But its ability, while seemingly powerful if it pulls out a Kel'Thuzad or a Ragnaros, can backfire if it pulls a battlecry minion, and can speed up your demise if you're playing a control deck with strong removal, such as Warrior or Priest. 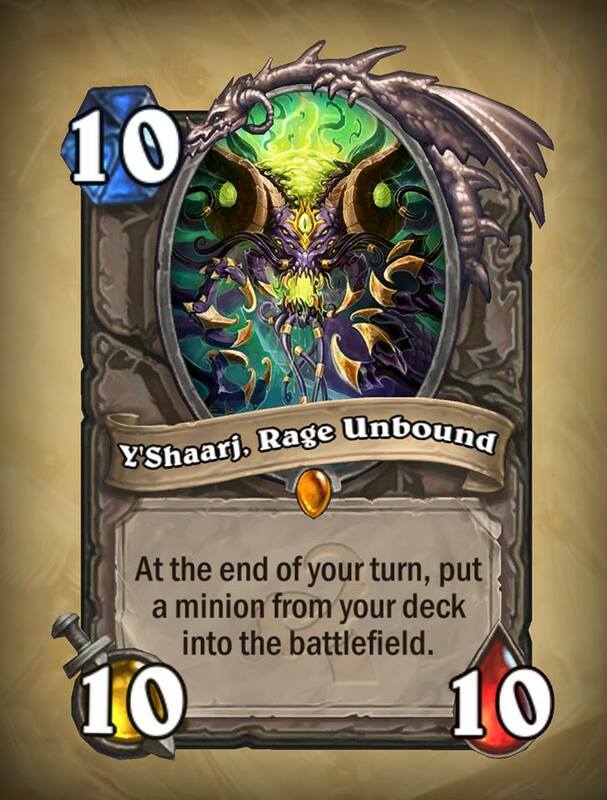 However, if you're short of better legendaries to fit in your deck, and you draw Y'Shaarj in a pack, it will do. Yogg-Saron is perhaps the most significant Old God in Warcraft canon, whether or not it is the most important in the lore, if only because it's malevolent presence was found all over Northrend in Wrath of the Lich King, it and the Lich King had a sort of mutually parasitic relationship, the lead-up to the Ulduar raid in which players fought it was, so it seemed to me, far more extensive than the lead-up to C'Thun's own raid, and the remaining Old Gods do not appear directly in World of Warcraft. I hear he makes a lousy neighbour. Yogg-Saron's battlecry is very random. In fact, it's so random that I have to say I'm disappointed - terribly disappointed - with this card's design. 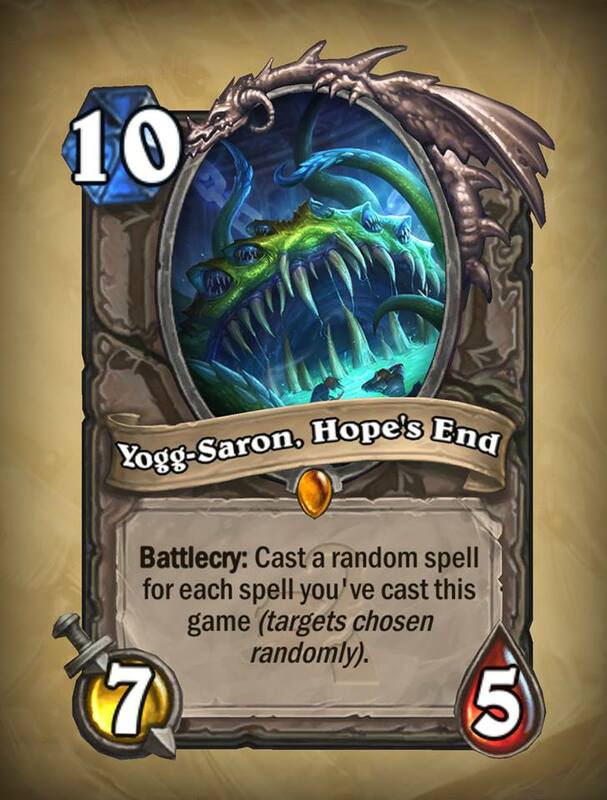 Yogg-Saron's stats are poor for a 10-mana minion (7/5), making it very vulnerable - if it survives the turn it appears. Its battlecry - casting random spells with random targets - means it could very well destroy itself with a spell. And there's no guarantee that the net effect of its battlecry will even be a net positive. Making it even more disappointing, from a personal rather than analytic perspective, is that Yogg-Saron was my favourite Old God in World of Warcraft, and indeed my favourite antagonist from Wrath of the Lich King. If you just want to play dramatic, fun cards with big, fancy, weird effects, then Yogg-Saron is the card for you. And that's fair enough. After all, it's just plain fun to see Elite Tauren Chieftain or Gelbin Mekkatorque come into play. However, I'm prepared to predict that Yogg-Saron will see almost no play in competitive Hearthstone. With the Old Gods out of the way, let us consider the legendary cards representing their servants. He's too Ascended for his mortal form. Or something. But seriously: Ywaq ma phgwa'cul hnakf. I don't quite know how he slithers. He has a venomous personality, I guess. Deathwing, Dragonlord is a variant of the Classic set legendary Deathwing. 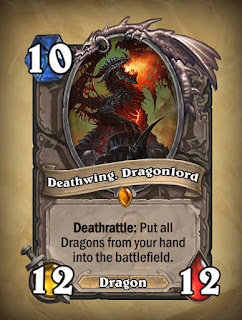 Where the Classic legendary emphasised Deathwing's status as "The Destroyer" and "The Worldbreaker", this version emphasises his status as the head of a dragongflight - formerly, the black dragonflight (as he was ordained by the titans), but, by the time of Cataclysm, his own Twlight dragonflight. His stats are identical to those of the Classic set Deathwing - a 12/12 for 10 mana. However, he now has a deathrattle effect, rather than the board-clearing battlecry of the Classic card. The deathrattle is a pretty strong effect, if you have something like Ysera or Malygos in hand, where there is no battlecry to miss out on, or even Classic Deathwing, whose battlecry you may want to skip. But many of the other dragons depend on battlecries to be useful, such as Alexstrasza, Dragon Consort, Azure Drake, and Twilight Dragon. In addition, unless you're a paladin with Dragon Consort or a druid with Innervate, Deathwing, Dragonlord is awfully slow. On the plus side, unlike Classic Deathwing, you can play him on curve pretty well automatically. A 12/12 body and a deathrattle that puts more good stuff on your board for free could be decisive. Herald Volazj is a dungeon boss in Northrend, in the ruins of the old Nerubian civilisation. He is a servant of Yogg-Saron. During the fight with Volazj, his signature ability is to cause each participating player to become trapped in a vision of madness, in which they fight twisted, illusory versions of their allies. So his Hearthstone card's ability is an appropriate adaptation of his power in World of Warcraft. 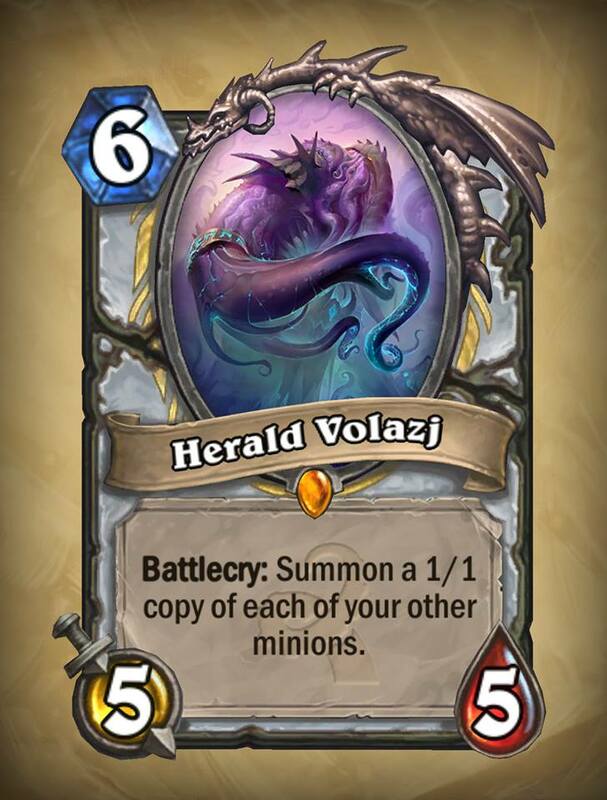 It must be said that Volazj is probably not a card you want to play on curve, although if you have a strong board it could be useful. 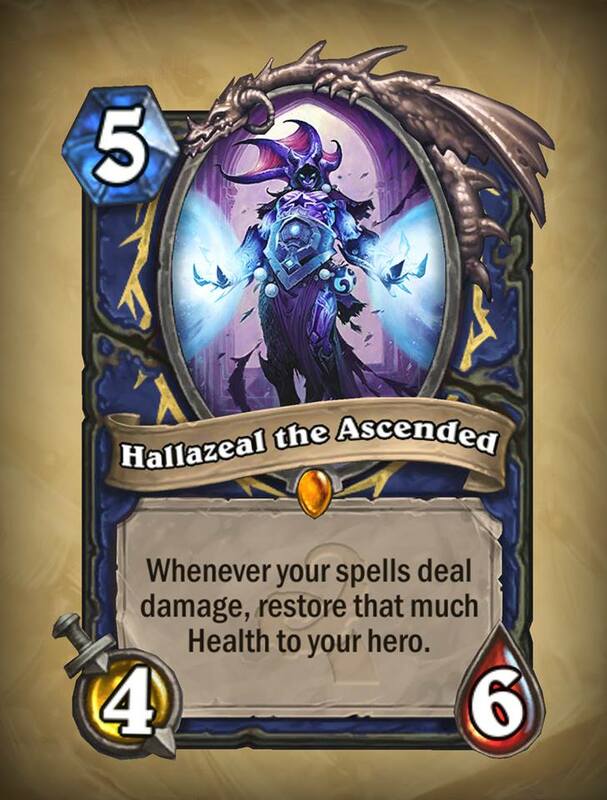 He becomes particularly valuable if you have one or more of cards such as Ragnaros, Ysera, Sylvanas, Confessor Paletress, or Prophet Velen in play, as these are cards whose value is not innately tied to their stats (save perhaps for Sylvanas). 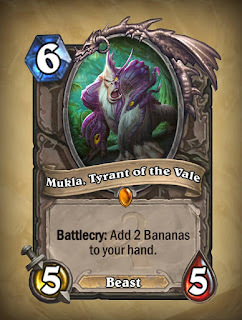 The downside is that minions usually have such a short lifespan when in play that quite often you won't have the chance to use Volazj well, and when you do he becomes a "win more" card. Hallazeal the Ascended is a bit player, being a minor enemy in one of the early zones that players explore in Cataclysm. As an elemental creature, he ends up being the shaman class legendary. His stats are comparable to other 5-mana minions, and even many 6-mana ones (such as Thaurissan or Reno Jackson), but he is probably not a 5-mana drop: to ensure value, players will want to combine him with some damage spells. 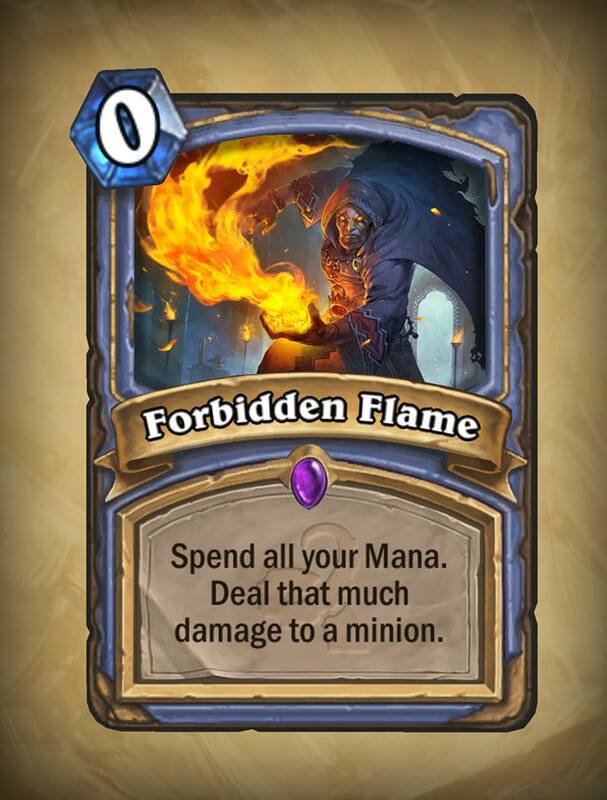 The issue with this is that shaman decks which want to play this long don't usually have a lot of damage-dealing spells. The most spell-heavy shaman deck, the "aggro" shaman, would find Hallazeal much too slow a card to play on curve, and usually wants to close out the game by the time his healing might come in handy. If some kind of hybrid shaman, mixing aggro shaman's early explosive power with some late-game durability, emerges as a viable deck, it would find Hallazeal to be a key element. 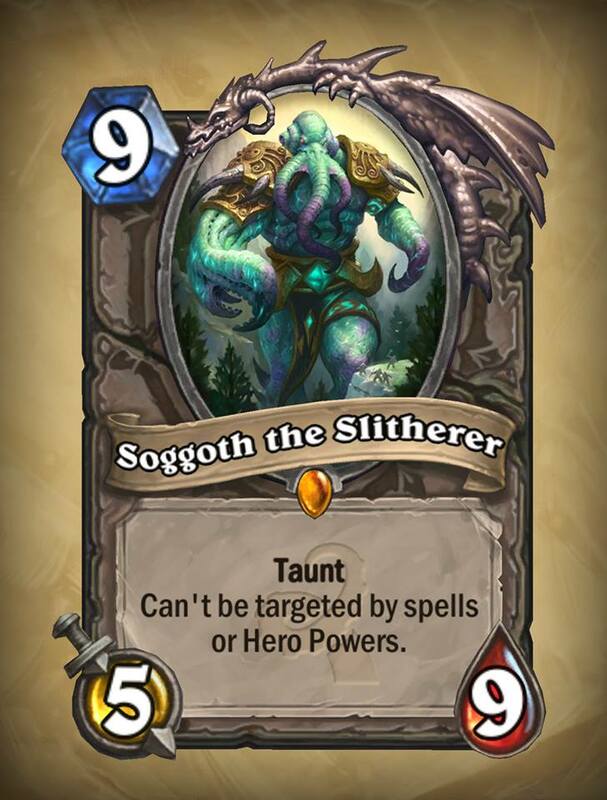 Soggoth the Slitherer was an ancient servant of the Old Ones, killed long ago during their war with the titans. Its remains endured for millennia, and appear in Darkshore, within the bounds of the night elf lands. The Twilight's Hammer cult tries to restore it to life after the Cataclysm. In Hearthstone, he has an interesting mix of abilities. He's actually a pretty good card, but 9 mana is in my view just too much to pay for what you get. Why have Soggoth as one of your 9-mana cards when you can play genuine finishers such as Alexstrasza, Ysera, Malygos, or Jaraxxus, or even the likes of Nefarian, Cenarius or King Krush? Xaril, the Poisoned Mind is one of the Klaxxi, one of the groups of insectoid mantids, creatures that live in Pandaria. They were once servants of the Old Gods. While the Klaxxi act as aides to the player characters in World of Warcraft, they freely admit they would rejoin the Old Gods should they ever return to power. 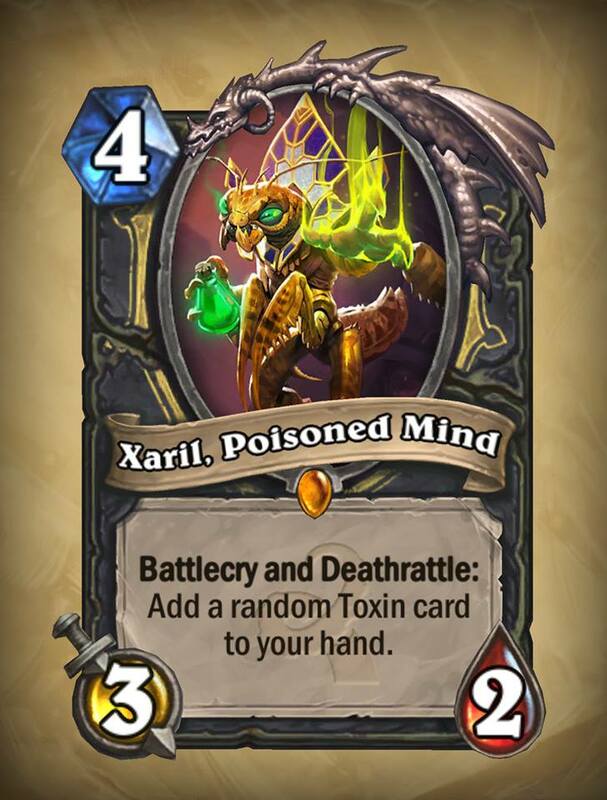 For his part, Xaril is a master of alchemy, and favours the use of toxins and explosives. Bloodthistle Toxin returns a friendly minion to your hand, and discounts its mana cost by 2. It's similar to, if weaker than, the rogue spell Shadowstep. Fadeleaf Toxin grants a minion Stealth until your next turn, hopefully protecting it during your opponent's turn. It's identical to Finicky Cloakfield (another card generated by random effects - in this case, the Spare Parts). Kingsblood Toxin draws 1 card. It's closest to Shiv, although drops the damage and 1 mana cost. 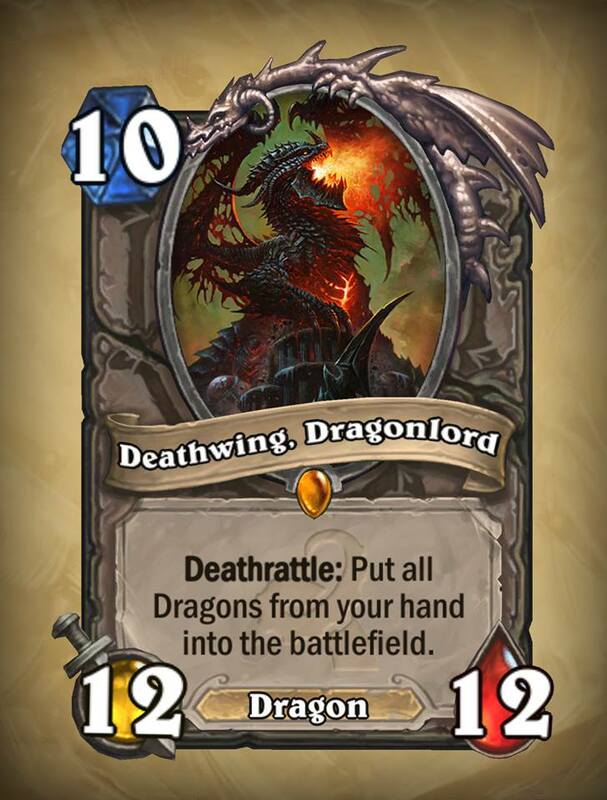 Although Deathwing, Dragonlord is a decent 10-drop and has a powerful effect, he's... well, he's a 10 drop, and you don't see too many of those in a deck. In addition, to get the most out of his deathrattle, you need to have other finisher-level dragons in hand, which might muck with your overall mana curve. Hallazeal doesn't really fit the shaman deck best suited to exploit his ability, and is, in my estimation, a poor choice for a shaman deck slow enough to play him. He might find some niche use somewhere, I suppose. Because of the downsides I have noted above, I don't see Volazj as being a great addition to priest decks. That calculation changes somewhat in Wild, where he can get you doubled up on minions with valuable deathrattles such as Piloted Shredder or Sludge Belcher. Although I like Soggoth's mix of stats, Taunt, and immunity to spells an Hero Powers, they come at too high a mana cost. He might have been better as a weaker card, stat-wise (say, 3/5) and costing around 5 mana. Xaril's Toxin generation is very valuable. I'd say the only thing holding him back from being nearly an auto-include in rogue decks (and therefore meriting an Excellent rating) is is 3/2 statline. Now, let us look at the legendary cards that are either corrupted or inverted versions of their original selves. All three of these, like the variant Deathwing introduced above, are Classic set legendaries as well. Not your standard model gnoll. DIE.... Insects? Er, would he say that? Hogger was an early-game "boss", usually the first true challenge faced by low-level human characters in World of Warcraft. Both he and his Classic version summon 2/2 Gnoll cards with Taunt in Hearthstone. The Whispers variant Hogger has a bigger body - 6/6 for 7 mana compared to Classic Hogger's 4/4 for 6. 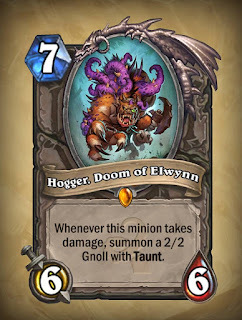 What may become a crucial difference is that you were guaranteed to get at least one 2/2 Taunt Gnoll from Classic Hogger, making him an effective 6/6 for 6 mana, where that might not be the case for Whispers Hogger. In fact, 7 mana is an awful lot to pay for what you get. A deck with a lot of self-immolation effects (such as Patron Warrior), or a control-style mage deck that uses Hero Power a lot (and can therefore ping Hogger to generate Taunting Gnolls) might be able to find a spot for him, but I doubt it. Ragnaros is a major antagonist in World of Warcraft, serving as a major raid boss twice. He is a quasi-primary antagonist in Classic World of Warcraft, and a secondary one in Cataclysm. Ragnaros, Lightlord presents a "what-if" scenario, in which Ragnaros the Firelord has, as it were, seen the light and changed his destructive ways. Both variants of Ragnaros are viable finishers, in the sense that, left unchecked, they will have decisive results on the outcome of a game. Ragnaros, Lightlord has the advantage of being able to attack, meaning you can decide where his 8 damage gets inflicted. 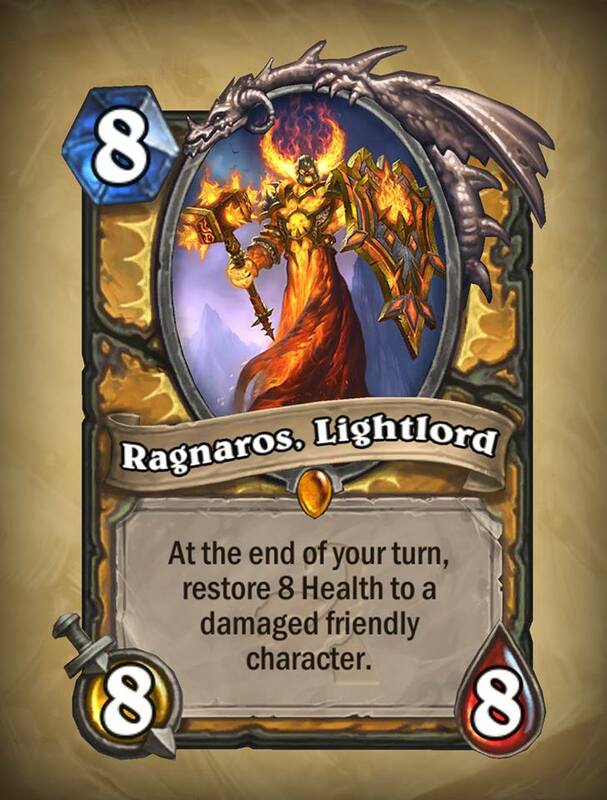 Like the Firelord version, the Lightlord's special ability automatically takes effect at least once, meaning someone's getting a big heal (hopefully the Hero playing him) before the opposition has a chance to remove the Lightlord from play. The Lightlord is, it must be said, slower than the Firelord in the sense that the Classic card can close the game out faster (because he deals damage, possibly to the opposing player, on the turn you play him). I came very close to rating Hogger Poor, but in the end, even in Standard where Dr Boom will no longer be present, there are plenty of other, better 7-mana cards you could play, and even other relatively poor choices (such as Rend Blackhand) are still better. 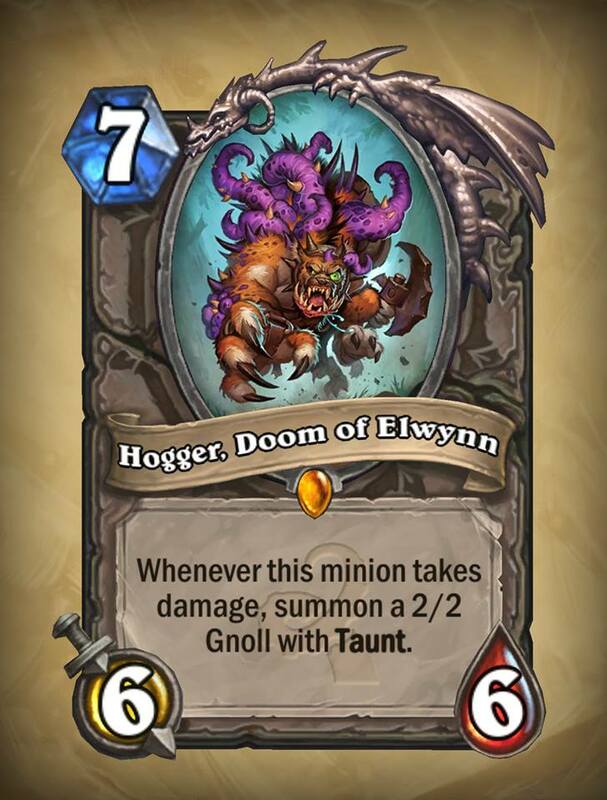 In Wild, it's inconceivable that anyone will play Hogger, Doom of Elwynn over Dr Boom. 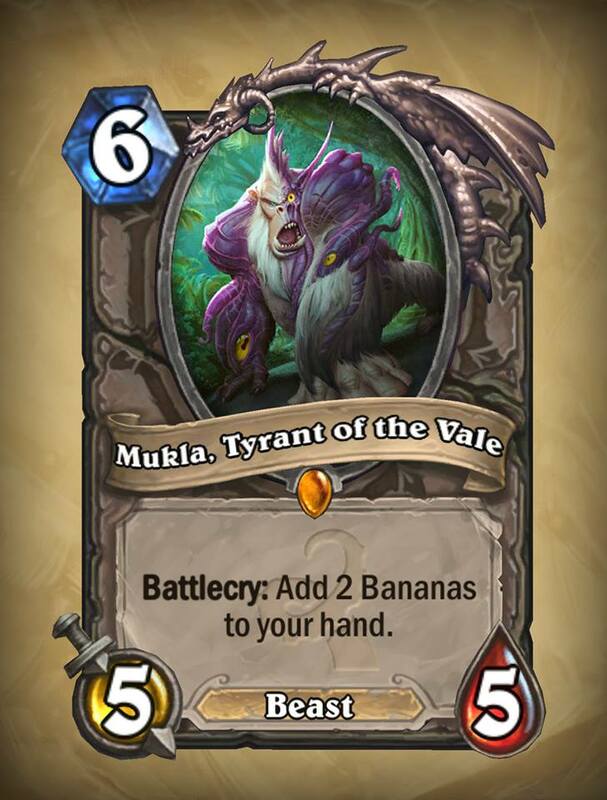 Mukla, Tyrant of the Vale is just too expensive at 6 mana. He'd definitely merit a Fair rating at 5 mana, at least in Standard format where obviously superior choices (such as Loatheb) will be unavailable. Rogue decks might find him useful all the same, because 1-mana spells are just so useful for Combo effects or in conjunction with Gadgetzan Auctioneer. 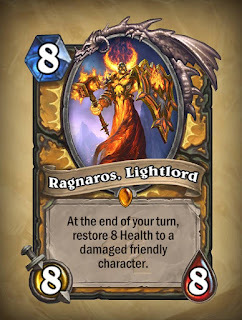 Ragnaros, Lightlord is pretty good, but he can't have a potentially decisive effect on a game the turn you play him unless your getting healed is what makes the crucial difference in a match. Every additional turn he lasts, however, makes his board presence increasingly significant. (Also, a control-heavy paladin could play both versions of Ragnaros for fun and profit.) Since that is true of pretty well every 8-drop in the game, the Lightlord falls short of a Good rating. I do expect he'll see some play, though. 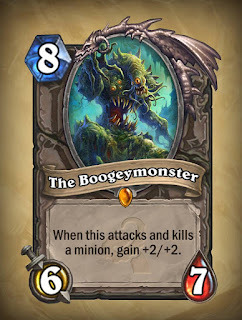 The last legendary I'm reviewing today is The Boogeymonster. There's no way it can be as impressive a boogeymonster as, say, Greenpeace. About the best thing I can say for it is that it doesn't die to Big Game Hunter straight away. I mean, compare The Boogeymonster to another 8-drop, Gruul. Gruul doesn't see much play, and gets bigger at the end of every turn. The Boogeymonster gets bigger if and only if you use it to attack the other player's minions. A real disappointing card. While the Boogeymonster has no World of Warcraft or other Warcraft product correspondence, the notion of the generic Boogeyman is pretty widespread. In that sense, riffing on such a prevalent cultural idea was a great idea, and it's just too bad it was implemented in such a poor fashion. It's what all the pyromaniacs want to learn at Hogwarts. How is healing forbidden? Beats me. "And we think we can turn this ooze puddle into Ragnaros the Firelord." All three of these cards have one quality in common: they trade power for flexibility. They do have an attractive feature in that they can prevent "dead" turns, where the only thing you can do is play your Hero Power and pass out the turn. 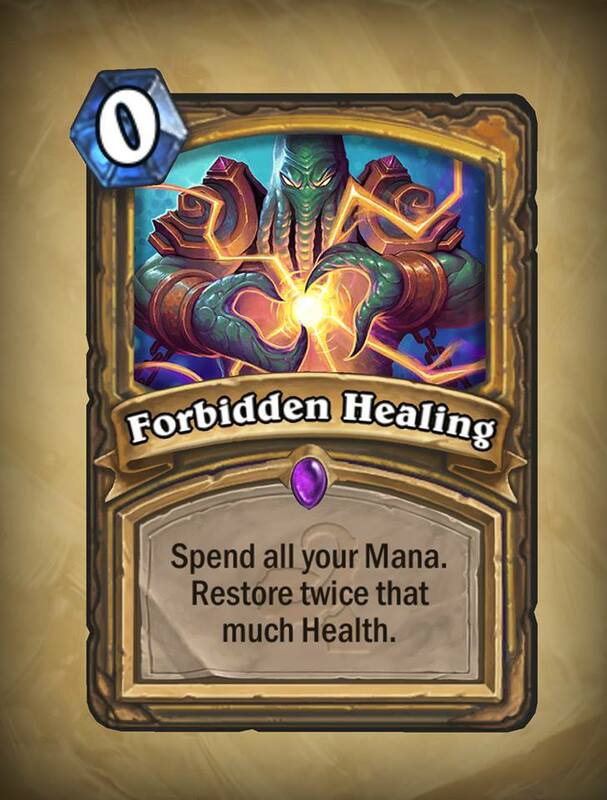 Forbidden Healing isn't particularly good at low mana costs, where Seal of Light or Holy Light are obviously better. 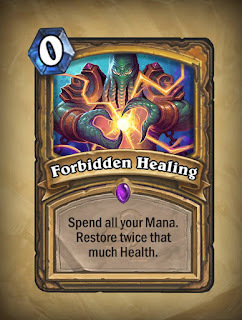 It doesn't compete well with Lay on Hands, which refills your hand as well as heal, although in fairness an 8-mana Forbidden Healing heals you for 16 damage. In endgame situations, though, it could be decisive. A control-oriented paladin could certainly use it to triumph in a fatigue game, given paladin's Hero power keeps generating tokens and it can out-damage the healing or armour of warriors or priests. 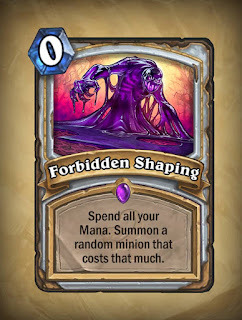 Forbidden Shaping is perhaps the most powerful Forbidden card, because it generates a minion. At high mana costs that minion is likely to be pretty valuable, although there are some duds (any minion whose value comes from, say, its battlecry rather than its statline - such as C'Thun). 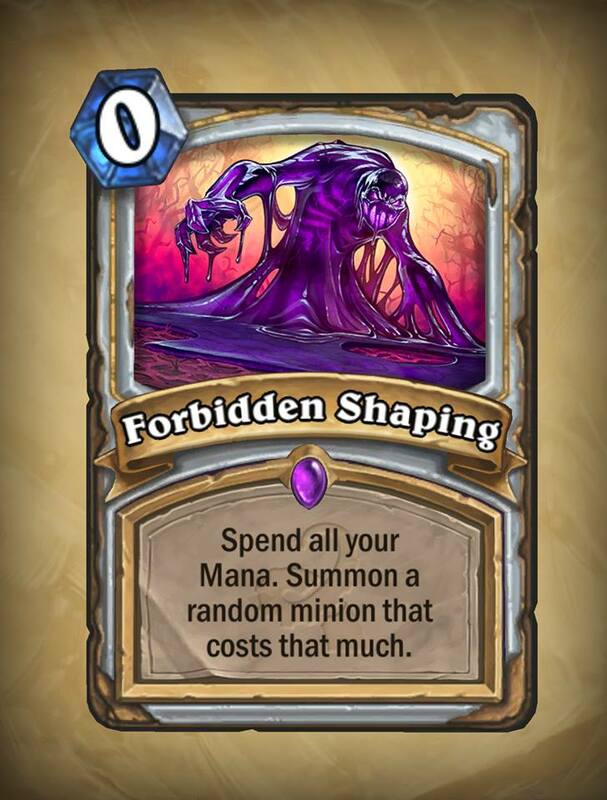 It's hard to see what cards you give up in order to fit this in, but given many key cards for control-style priests are rotating out of Standard format, there might be an opening for Forbidden Shaping. All the Forbidden cards don't quite reach the stage of being Good (that is, a must-include in at least some deck archetypes), but they are definitely viable choices for control-oriented decks. 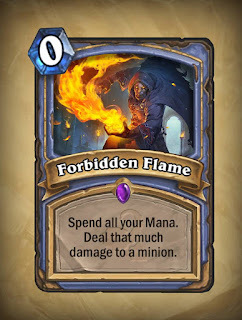 Mages could simply swap out Pyroblast can precisely target key enemy minions, control paladins can count on clutch (or fatigue-resisting) massive heals that aren't finicky like Reno Jackson, and control priests, who are otherwise very reactive, can avoid dead turns by laying down some rather large minion. I would say that they're "season to taste" kind of cards. That's it for this round of reviews. Stay tuned for more!